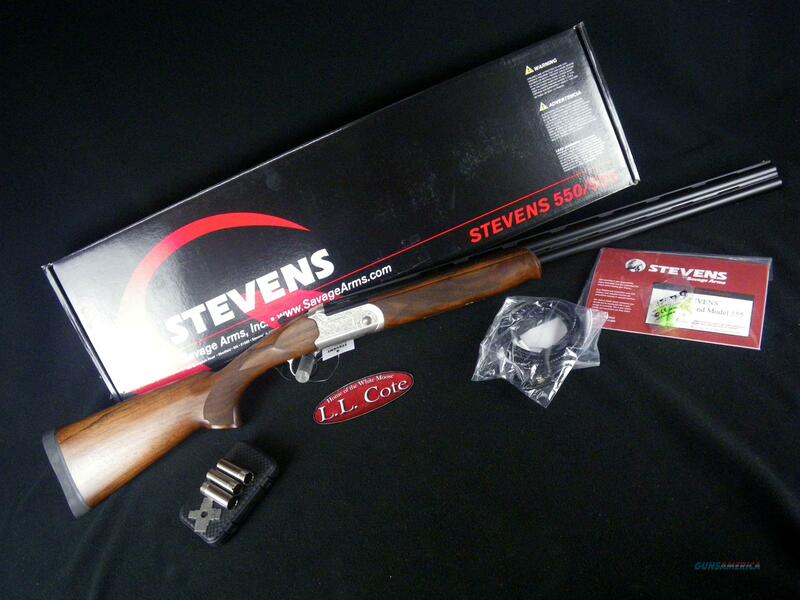 Description: You are bidding on a Savage Stevens 555 in 12ga with a 28" barrel. The New Stevens Model 555 Enhanced Over/Under shotgun from Savage Stevens exhibits great traditional style and balance at an affordable price. Whether your passion is breaking clays or chasing upland birds, the model 555 Enhanced is the firearm for you. Fast handling, lightweight and superbly balanced, this break-action over and under features an aluminum alloy receiver, single selective mechanical trigger, manual safety and checkered Imperial walnut stock. It comes equipped with five interchangeable choke tubes. The Savage Stevens 555 Over/Under is a fantastic shotgun for any sporting application! Displayed images are stock photos. Any questions please feel free to ask (our phone number is in the additional information tab above).